This period is also known as the “Reunification period” and it started from 2050 BC until 1710 BC. This period starts with the eleventh dynasty under the reign of Mentuhotep II and stretches until the thirteenth dynasty. Osiris became the most important deity during this kingdom of Egypt. There are two phases in that period, the first one was during the 11th dynasty who ruled from Thebes and the second one was during the 12th dynasty. The Egypt Middle Kingdom was followed by the Second Intermediate Period of Egypt, which involved some foreign invasions by the Hyksos of West Asia. After the decline of the Old Kingdom of Egypt, Mentuhotep II was able to conquer his rivals in both Upper and Lower Egypt. He established the 11th dynasty with a capital at Thebes. It was a period of stability & prosperity. The center of power of Egypt shifted from Thebes in the south to Lisht near the oasis of Fayoum during the reign of the 11th & the 12th dynasties. Several pyramids have built during that period in Lisht but they were destroyed because of their internal design and the external factors they had to face. After the end of the Old Kingdom of Egypt, there has been a fight between the tenth & the eleventh dynasties. The tenth dynasty ruled Lower Egypt in the North and the eleventh one ruled southern Egypt. Mentuhotep II was the founder of Egypt Middle Kingdom and he restored the Egyptian hegemony over the reign in Sinai and he also restored the cult of the ruler. He depicted himself as a god in his own lifetime, wearing the headdresses of Amun and Min. He died after 51 years of ruling the Egypt Middle Kingdom and passed his throne to his son Menthotep III. Menthotep III ruled for twelve years and he continued consolidating Theban rule over the whole of Egypt in addition to sending the first expedition to Punt. Mentuhotep IV succeeded his father Mentuhotep III who was omitted from the king lists. During this dynasty, armies were trained to against invasion, or for expeditions up the Nile or across the Sinai. During the reign of Amenemhet II, the state of ancient Egypt was stable as he strengthened defenses between Egypt and Asia, in addition to building the Walls of the Ruler in the East Delta region. He also built the new capital of Egypt in the north, which was called Amenemhet Itj Tawy, or Amenemhet. Amenemhet modified nome borders, and appointed nomarchs to secure his position. He established his son, Senusret I, his co-regent in the 20th year of his reign. Surprisingly, Amenemhet II was murdered during the 30th year of his reign in a palace conspiracy. The reign of Amenemhet II was a period full of peace and there is some description on the walls of the temples at Tod & Memphis that show the peace treaties he made with certain Syrio-Palestinian cities. After the death of Amenemhet II, his son Senusret I succeeded him and he was a warrior king. He launched a series of brutal campaigns in Nubia in his sixth, eighth, tenth, and sixteenth years of his reign. He also built massive forts to establish the formal boundary at Semna between unconquered Nubia & Egyptian conquests. The notable thing about Senusret is that he was credited for administrative reform, which put more power in the hands of appointees of the central government, instead of regional authorities. Through his reign, Egypt was divided into three sections, which are North, South, and the head of the south. The last warrior pharaoh was Senusret III whose name was Hellenized by later Greek historians as Sesostris. He was worshipped as a patron god by the Egyptian settlers and his son Amenemhet III began reigning after Senusret’s 19th ruling year. The highest level of economic prosperity occurred during the reign of Amenemhet III. As mining camps in the Sinai were operated on a semi-permanent basis. He continued the Faiyum land reclamation system and after a reign of 45 years, Amenemhet III was succeeded by Amenemhet IV. During his reign, the dynastic power started to weaken and there were some crop failures. He was succeeded by the first female queen of Egypt Sobekneferu. The River Nile Flood was the Gift of God to all the ancients to be fed as the collapse of the Old Kingdom was due to the low flooding of the Nile. Some of the literature of that period shows the Instructions of Amenemhat, where the king tells his son how agriculture prospered under his reign. The Climate of Egypt was so fine during that period that agriculture started to spread all over the country and people were able to plant their desirable crops. The block statue was one of the master innovations during the Egypt Middle Kingdom through which a man squatting with his knees drawn up to his chest and his arms folded on top of his knees. There are two types of block statues: statues with the feet completely covered with a cloak and statues with the feet uncovered. Texts were written for the purpose of entertainment and intellectual curiosity during the Egypt Middle Kingdom for the first time as the old texts used to maintain the divine cults, preserve souls in the afterlife, in addition to documenting accounts for the practical uses in daily life. Moreover, written works of the Middle Kingdom were transcriptions of the oral literature of the Old Kingdom for example litter-bearers’ songs were preserved as written verses in tomb inscriptions of the Old Kingdom. After the unification of Egypt through the eleventh dynasty, a centralized administration had to be created. There was a vizier in the north & a vizier in the south. Upper and Lower Egypt were divided into separate districts and governed by separate administrators during the Egypt Middle Kingdom in addition to the procedure of moving the governance of the royal residence into a separate division of government. It was the first Hyksos dynasty, who preferred to stay in northern Egypt since they infiltrated from the northeast. Then the 16th dynasty ruled for 70 years, which was followed y the Abydos Dynasty and finally the 17th century marked the end of that period. 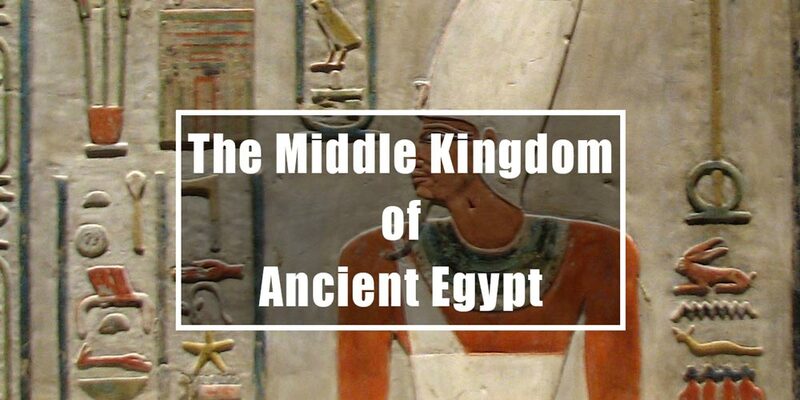 The New Kingdom of ancient Egypt was formed after the creation of the 18th century. This period starts with Ahmose I, who completed the expulsion of the Hyksos. Finally, If you are really interested in exploring the hidden secrets of ancient Egypt, so we recommend to check our Egypt tour packages or our Nile cruises and book a tour which includes an expert tour guide who will explain the most hidden secrets of Pharaohs.